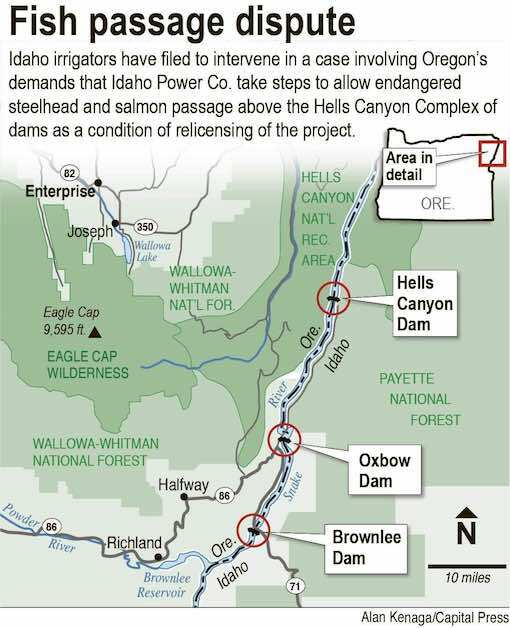 to force the reintroduction of endangered fish in the Snake River upstream of the Hells Canyon Complex of dams. BOISE -- Idaho irrigators are backing four bills in the state Legislature challenging the State of Oregon's attempt to reintroduce endangered fish into the Snake River watershed upstream of the Hells Canyon Complex of dams. For decades, the Brownlee, Oxbow and Hells Canyon dams -- which provide about 30 percent of Idaho Power Co.'s total energy -- have blocked the migration of anadromous salmon and steelhead trout, which once spawned in the upstream channel and tributaries. The original federal license to operate the complex expired in 2005. As part of the ongoing relicensing process, Oregon issued a draft Clean Water Act certification re-establishing the historic migration, in conflict with Idaho's draft certification. In late December, the Federal Energy Regulatory Commission dismissed Idaho Power's petition requesting that it step in and settle the dispute between the states. Four bills, drafted by the Idaho Water Users Association, were introduced Feb. 14 in the House Resources and Conservation Committee concerning Oregon's plan. House Joint Memorial 002 would formally express the Legislature's opposition to re-introduction due to the "drastic impacts on irrigated agriculture, industry, water supply and electric generation." The joint memorial concludes Oregon's plan would impair Idaho's sovereignty over its water resources, thereby violating the State Water Plan. "(HJM 002) will support the longstanding position of the Legislature, as well as the governor, that there will be no endangered fish above Hells Canyon. Not only no, but heck no," said Rep. Marc Gibbs, R-Grace, a farmer who heads the House committee. "It's an issue that Oregon wants and Idaho pays for." On the same day, the committee also printed three bills clarifying Idaho code on forced reintroduction of an endangered species by another state. HB 169 would broaden a state law requiring the Idaho Legislature's blessing before the federal government or another state can forcibly introduce a species. HB 170 clarifies that Idaho has primacy over its state waters and prohibits any species introduction that could threaten that primacy, without state consent. HB 171 grants the Hells Canyon Complex a special exemption to an Idaho law requiring infrastructure for fish passage past dams and other water obstructions. Marilyn Fonseca, hydropower program coordinator with the Oregon Department of Environmental Quality, said her state has extended a public comment period on the draft Clean Water Act certification until Feb. 28. Oregon would like to introduce salmon and steelhead into Pine Creek -- a tributary that originates in Oregon and connects with the main-stem Snake upstream of the dams -- and expand to other tributaries based on the level of success. The plan would require Idaho Power to trap and transport trout to assist them on their migration back to the Pacific Ocean. Fonseca explained her state considers fish passage to be integral in meeting its own EPA-approved water-quality standards. "We're certainly aware that (Idaho) is not happy with the inclusion of fish passage, but we are continuing with that process," Fonseca said. She said Idaho, Oregon and Idaho Power officials are already collaborating on efforts to address water-quality impairment upstream of Hells Canyon, due largely to agricultural nutrients and sediment. Idaho Power spokesman Brad Bowlin said his company supports the irrigators' bills, noting 95 percent of the company's customers are in Idaho. "We really think this water quality certification process is not the appropriate place to introduce this passage and reintroduction issue," Bowlin said.